Wrapping up another busy summer week. We've tried to keep busy on purpose this week. My husband has been away with work and trying to keep us all busy led to many wonderful new experiences. We learned a lot while having fun with one another and taking frequent field trips. Our friends and families were wonderful about keeping us company and we tackled a few home improvement projects along the way too. 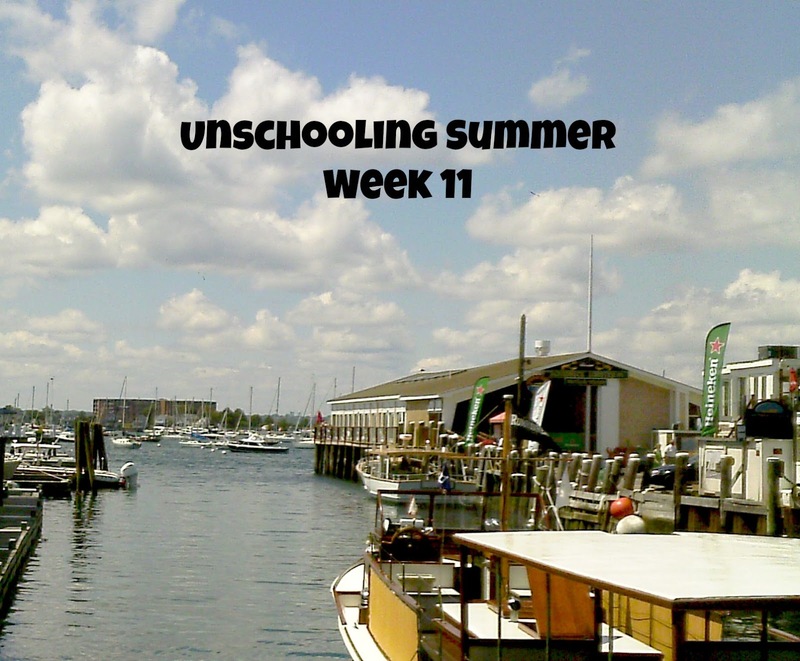 It's been wonderful and we're looking at the calendar wondering where the summer went! Seriously, where did it go?? Science-- We went on a field trip to a new zoo last Friday. While it was a pretty small zoo we got to see a lot of new animals. We were excited to see a serval and some meerkats. We also learned about hornbills, Victoria crowned pigeon, two toed sloths and fruit bats. The boys watched a few episodes of Mythbusters this week, learning about driving while talking on cell phones, the abilities of drones, and the world's most difficult plane (to drive). We spent some time walking through a rose garden checking out the different colors, sizes and types of roses. We watched forged in fire and talked about metal working/ sword making; something that came up a few times as the boys were checking out pocket knives at a seaside shop. Reading-- We finished up our Inkspell book on CD and read several more chapters in the Hero's Guide to Saving Your Kingdom. Ian and I came real close to finishing up Mockingjay and he even offered to read one of the chapters to himself summarizing it for me when he was done. Alec has read a few books this week too. He read Island of the Giant Pokemon, Warriors, and The Amulet Keepers. Evan re-read some of the Elephant and Piggie books: My Friend is Sad and Let's Go For a Drive. Geography-- Evan worked on putting our United States puzzle together one day. It's a wooden puzzle that calls out the name of each state and it's capital city as you put the pieces back in. Ian colored a picture all about Russia with a cathedral and a troika dolls while doing some arts and crafts projects this week. It prompted him to talk about Russia and the Olympics and everything he remembered. The boys also all read about the various bear species found throughout the world and had a great time checking the map of each animal at the zoo to see where they were from. Math/Logic/ Technology-- Evan put a few puzzles together one day just trying to keep himself occupied. He's not usually one for puzzles but sat on the floor and put together a good two or three of them from start to finish. The boys also worked on their review sheets practicing their math facts. They measured themselves at the zoo and compared their heights and "wing"-spans to the various bird species. They spent lots of time playing video games too; trying out new ones and re-playing old ones. They had friends over one rainy day and all the kids linked together to play Terraria. 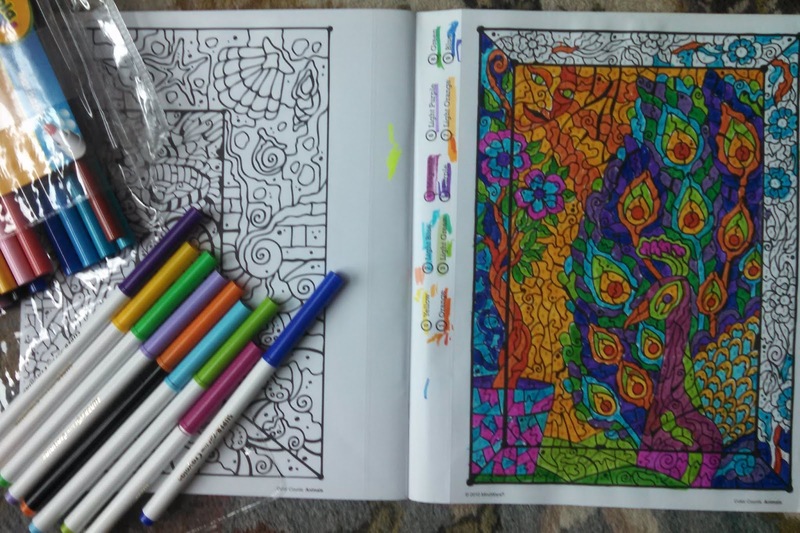 Arts and Crafts -- Alec really wanted me to purchase him a coloring book when we went to the craft store this week. It was a pretty intricate book with all sorts of wonderful animal pictures and best of all the pages are single sided so he can color them in with markers. He's worked on a few of the pages and they're coming out beautifully. 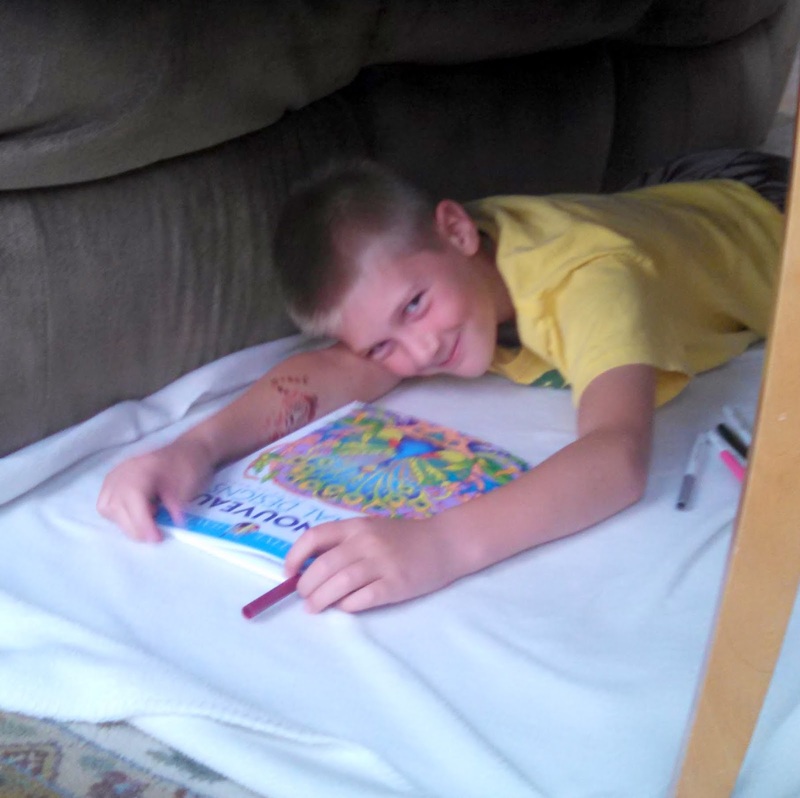 He actually set up a fort one rainy morning to color inside of and his brothers decided to join him and color for a while too. We had to go back to the craft store later in the week and Alec ended up buying himself another coloring book; this one was called mystery mosaics. 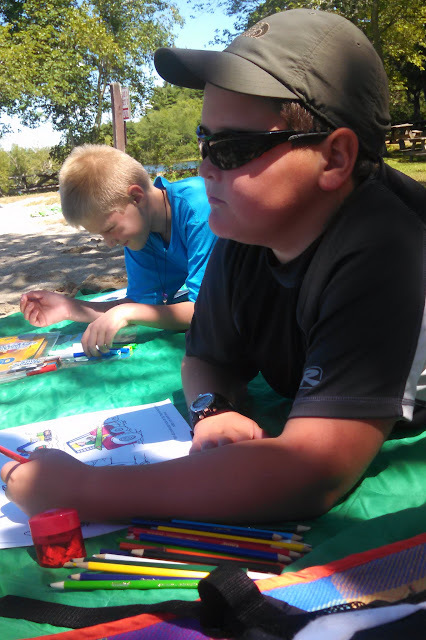 He brought it to the park along with some markers and started in on one of the pictures. 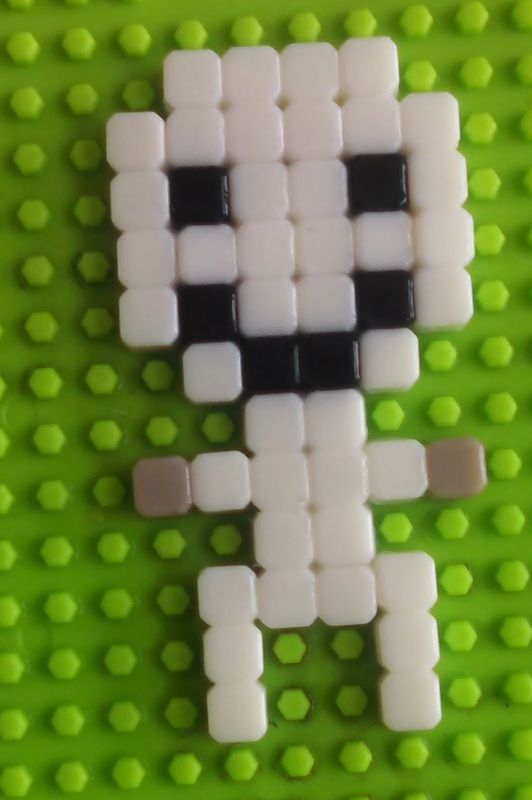 Alec used his Qixels and decided to make up his own "guy." The kit comes with templates to make different people but Alec decided to free form his own Minecraft Skeleton and it came out really, really well. He did have to use black eyes and take out the gray eyes to use as his hands since he ran out of white pieces but you can definitely tell what he was making and I loved that he was able to problem solve his own solution. 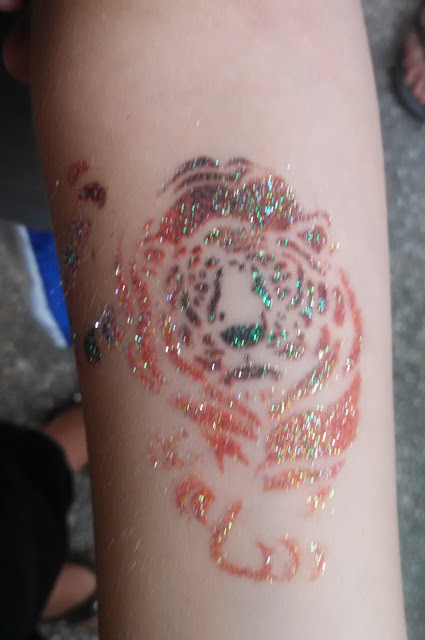 We went to a local street fair/ festival and the boys all got temporary tattoos airbrushed on. 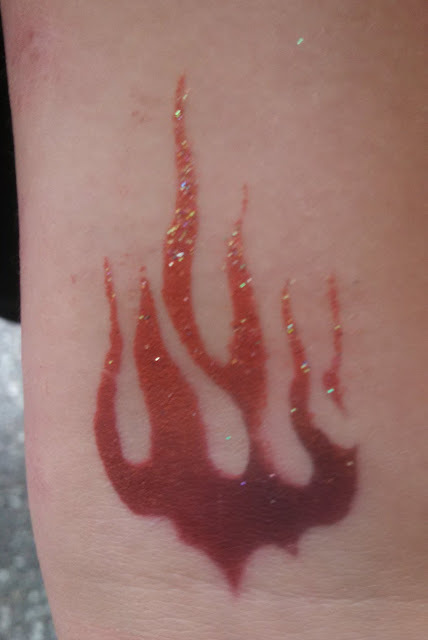 They asked so many questions about the paint, how to make the tattoos last longer, the glitter she was using, etc. It was great to see how interested they were. We walked through an art gallery in Newport looking at all the different paintings, glass art sculptures and checking out the price tags to go along with it all. Life Skills-- Ian spent a few days this week helping his grandfather out at work. All three boys helped vacuum, dust, wash floors and do the laundry this week. They also helped plan and cook their own breakfasts, lunches and dinners too. The boys helped me pick out paint for the bathroom and each took a turn helping me paint a little. Ian and Evan went fishing one night with their grandfather and each caught a fish. Ian helped me hang our new shower curtain rod and make sure it was level. History-- While at the library we spent some time checking out a display. There is a local flood control dam in our town that will be 50 years old this fall and they have all sorts of pictures dating back more than 50 years of the area as well as hiking maps, information about the floods that prompted the building the building of the dam, and how the dam is used today. We took a boat cruise around Newport harbor and learned all about the mansions and a bit about the history of the harbor and it's light houses. We also learned about scrimshaw and the "hospitality pineapple." Physical Education-- The boys had fun riding bikes and swimming one day in the pouring rain. They found a giant puddle at the end of our driveway and had a great time jumping, splashing and riding bikes through it. We spent an afternoon at a local park swimming and playing with all our friends. 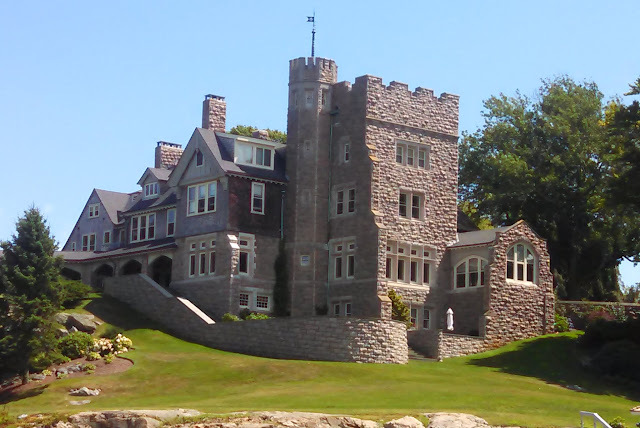 We spent an afternoon walking all around historic Newport. 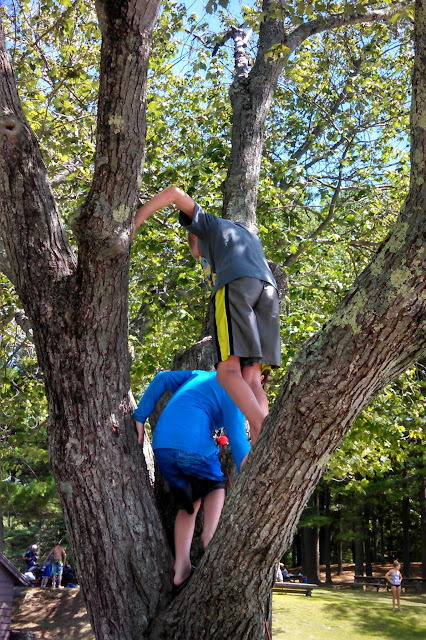 Alec spent an afternoon at the park climbing trees and trying to get higher and higher. Writing-- Alec has started playing Trivia Crack with a few of his friends and has spent so much time writing back and forth with them. He's checking with me on making sure most of his spelling and punctuation is correct and having a ball communicating back and forth with them as well as learning all sorts of wonderful trivia facts! Socialization-- We met up with lots of different family members and friends at the street fair. We had some friends over to play one day this week and met up with other friends at the lake another day. We met lots of new people the day we went to Newport and Alec made friends with the nice lady narrating our boat ride. He got to wear her coat and everything! My father and my great grandmother came to visit this week also and the boys had fun visiting with family. Wow! Your family sure had a busy week! Love the variety of activities! Thanks! We certainly succeeded in keeping busy. We'r always on the lookout for new things to try and try to touch on all the subjects at least once a week.